Top 10 Shores to Sea In Europe! There is certainly nothing more tantalising than the sight of azure water gently rippling over white sand and reflecting bright and brilliant sunshine. In Europe, there are plenty of seaside spots where you can find dreamy beaches and get your fill of unbelievably crystal clear and glittering water. We’ve narrowed down a mighty fine top 10. With rocky coves and enchanting beaches that look like something out of a dream world, the Grecian island of Crete boasts an enigmatic landscape and its beaches with crystal clear waters are a prime draw to the island. 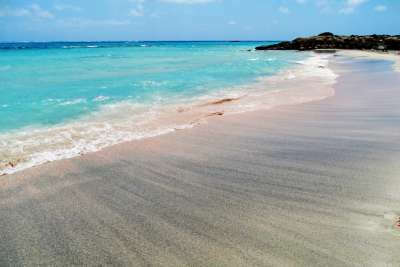 The fine pink sands of Elafonisi are among the island's most famous, with rose coral mixed with the sand giving it a pearlescent hue. What's more, the waters are shallow and still, making the pristine reflection even more mirror-like. This fascinating little chain of islands in the heart of the Mediterranean is surrounded by incredibly translucent water that has been heated by Africa's warm climate in the south, and southern Mediterranean sunshine. For those looking for more than a view of the Med, head to the northern island of Comino. The Blue Lagoon is a particularly impressive cove where the sheltered rocks make the lapping water crystal clear. While Norway's dramatic craggy fringes aren't the ultimate spot for a seaside swim, the coastline is made up of staggering cliffs and gorges that give way to the icy clear waters of the Norwegian Sea - a sight worth seeing and one that well and truly deserves a spot on your travel bucket list. There are plenty of spectacular cruises that wind past the country's otherworldly landscape. 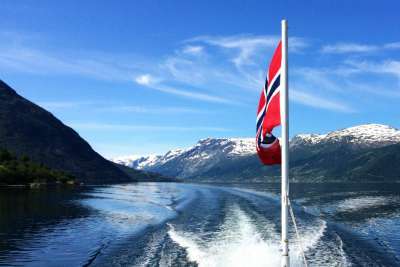 Alternatively head to the charming fjord town of Flåm from where you can take to the clear waters yourself. Armed with a kayak, you can soak up the sights of tumbling waterfalls, towering cliffs and the glittering and clear sea stretching out to the horizon. 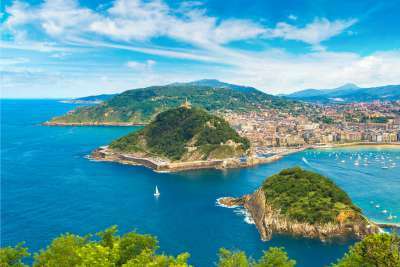 Straddling the French and Spanish Pyrenees lies the Basque country which is blessed with some splendid beaches that boast emerald clear water lapping their shores. Playa de la Concha is a particularly stunning spot with its horseshoe-shaped bay studded with vibrant tavernas. When the tide goes out, the sand is beautifully exposed and visitors can walk to the island that was once the site of an ancient monastery. Waters here are still and calm thanks to the surrounding mountains that protect the beautiful bay from the high tides and wind of the Atlantic. This region of Italy is beautifully coloured, from the warm terracotta of Italian rooftops to the bright primary pop of tropical flowers. But it is the turquoise blue of the Mediterranean that stands out the most. 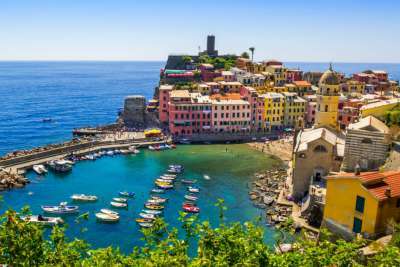 La Cinque Terra is a string of ancient seaside villages on this rugged stretch of coastline that all have their own idyllic bays, known for incredibly crystalline waters. The rocky coast makes for extremely clear waters so snorkelling here is a must. To the west of the Mediterranean Sea is the cluster of Balearic Islands. On the picturesque island of Majorca you'll find the translucent waters of Es Trenc Beach. This corner of the island is the only beach that has avoided being developed as it's protected as an extension of the Es Trenc-Solobrar wetland reserve. This is Majorca's breeziest spot, making it a favourite for water sports enthusiasts. Behind the beach are soft dunes and tamarind groves which add to the beach's scenic views. Canyamel is another beach with clear turquoise water that has gained it a Blue Flag. 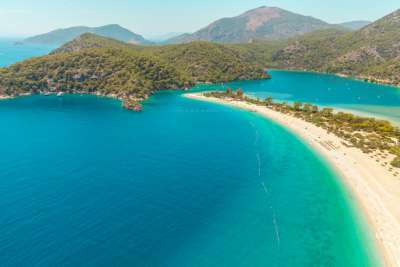 What with a sheltered lagoon protected from battering winds and a lush tropical national park spilling out onto the sand, Olu Deniz is an incredible juxtaposition of verdant greens and electric blues of the glass-like Mediterranean. The blue lagoon sparkles in the brilliant sunshine and for those who want a better view point, there is the option to take to the skies, with paragliding a particularly popular pastime in the area. 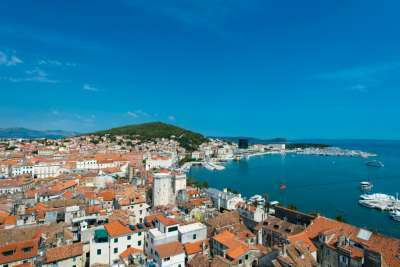 The exuberant city of Split spills out onto a spellbinding coastline and is dotted with Roman monuments, bars and atmospheric old town walls. The forested mountains of this region provide a scenic backdrop for the shimmering Adriatic Sea that frames the Croatian coastline. Split's beaches range from sandy to pebbly coves, and the lack of tides make the sea water here particularly clean and tranquil. Bacvice Beach is the city's most popular, and with its astonishingly transparent waters, it's clear to see why. 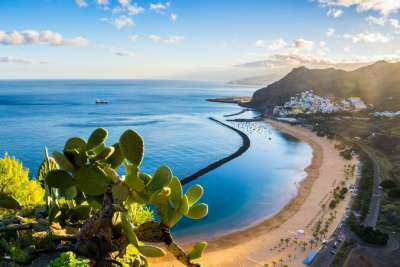 Surrounded by the waters of the Atlantic Ocean and off the coast of Africa, Tenerife has a unique geographical location. Las Teresitas is a refreshing break from the blackened volcanic sands of the majority of Tenerife's beaches, with a swathe of golden sand that has been imported all the way from the Sahara Desert. The beach lies just north of Santa Cruz and is in the shadow of the sweeping Anaga Mountains. Protected by a man made reef, the clear waters are calm. The Algarve is the most southerly region of Portugal and has a mammoth 88 beaches flying the Blue Flag for cleanliness and pristine waters. Between the west's cliffs and rocky outcrops, to Vila Real de San Antonio in the eastern Algarve, there are over 100 kilometres of astonishing golden beaches. With cerulean waters that make the coastline shimmer, you’d be hard-pressed to find beaches so alluring. Dip your toes in the water here, and you’ll still see them being swished by the waves.